When Kitchener first stepped into the War Office, two hours before he had even been formally given the seal of office from King George V, he is reported to have said, ‘There is no army!’  His exasperation was genuinely felt but somewhat misleading. The full strength of the British army was 700,000 men of whom 110,000 were serving in India or some other station in the Empire. The Expeditionary Force totalled around 120,000 men specifically trained for the war against Germany. Kitchener’s outburst had considerable merit for he grasped immediately that, in a fight to the death, Britain needed a real, fully trained and equipped army. To the shock of those who thought that war could be waged with limited liability, Kitchener dismissed the lame belief that it would be over by Christmas. He immediately laid his plans for an army of seventy divisions, calculating that its maximum strength would be reached during the third year of the war, when the enemy began to suffer from a reduction in its manpower. In other words, briefed as he had been by the men who ran the Committee of Imperial Defence, Kitchener embraced the need for a long war. It would take time to train and arm an army of millions, which was the only way by which Germany could be definitively beaten. Yet, even these calculations were based on a crude estimate of available manpower, not strategic requirements. Asquith had ruled out compulsory military service, anathema to Liberal thinking, so Kitchener took matters into his own hands. He decided to expand the regular army by raising a new component – wartime volunteers. Each man was required to sign up for new ‘general service’ terms of three years or the duration of the war (whichever the longer). 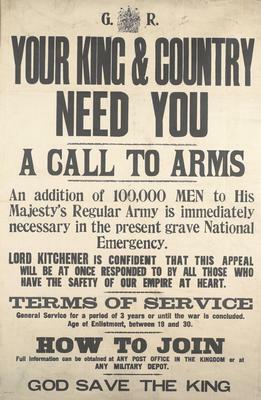 ‘Your King and Country need you: a call to arms’ was published on 11 August 1914. It explained the new terms of service and called for the first 100,000 men to enlist. This figure was achieved within two weeks. 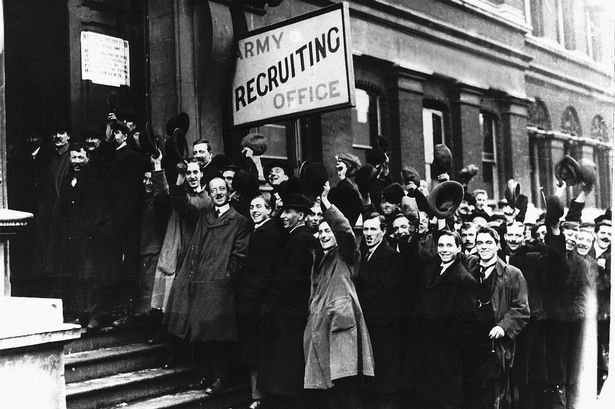 Kitchener’s recruitment scheme in 1914 was a resounding success. Alfred Leete’s famous cover picture of him pointing his finger over the slogan ‘Your Country Needs You” was a masterpiece of propaganda. The recruitment poster became iconic. Margot Asquith, the Prime Minister’s wife is widely quoted as claiming that ‘if Kitchener is not a great man, he is at least a great poster’. He was of course aided and abetted by the Secret Elite’s propaganda campaign supported by the Church of England and justified by the intellectual brigades marshalled in Oxford University. And herein lay Kitchener’s critical worth to the Secret Elite. It mattered not whether the tale of the Secretary for War and the Royal Prince was true or apocryphal. Such stories emphasised his popularity. He was the commander. Kitchener’s presence in the public eye made war popular. He looked the part. His military record read like a roll-call of imperial victories. The essence of heroism washed over him. In an age before public relations, Herbert Kitchener was the dream-ticket. Richard Haldane, whom Asquith would have preferred as Secretary for War, could never have aspired to such popularity even had he not been dubbed pro-German by the press. Unfortunately for him, the Northcliffe press was rabidly anti-German and to have such a man as the most senior war office politician made little sense to the public. This may explain why Haldane, an experienced and faithful agent of the Secret Elite was literally abandoned by them. Would he have had the stomach for the complete destruction of an enemy race from whom he had genuine sympathies? Herbert Kitchener was their preferred choice. He would be the Secretary of State who could promote a long and successful war to crush Germany and keep it popular. But he was a qualified risk. 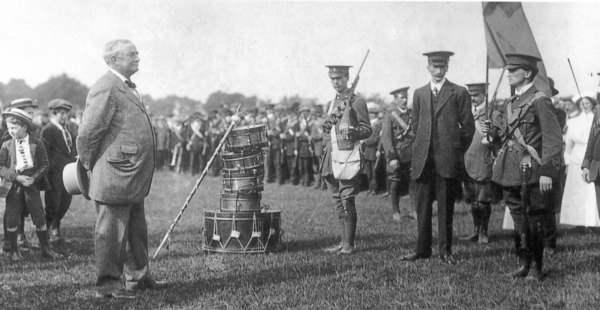 In September 1914, Alfred Milner wrote to an army friend ‘I hope your Chief stands it well. We all depend on him and it is the greatest mercy that he is at the head of things.’  This was true. Kitchener had dismissed any likelihood of a short war, had plainly stated that total victory would take time and unqualified effort. Victory would come at a cost. He connected with the nation in his appeal to raise a new army and stood apart from the politicians who placed their faith in democracy. But he also had enemies who wrote and spoke privately behind his back; enemies in the General Staff and in the Cabinet. The struggle in which Kitchener found himself embroiled was to be as all-embracing as that on the Western Front, but at the onset of war, he was the Ace in the pack. Critically, Kitchener associated himself absolutely with his men. They were his armies. Indeed the War Office code for the various intakes of recruits was K1, K2 and so on. He made a point of inspecting each new battalion before it embarked for war. He considered it his duty to see them in person. No matter the weather conditions, there he was bestowing an almost apostolic blessing on the passing ranks. His pride in them was clear. His loyalty to them was reciprocated. His prestige brought into being the greatest volunteer force ever raised any country and each new parade added to his momentous prestige. Yet his judgement, viewed from afar, was not without prejudice. Kitchener backed a decision which was to hasten the ultimate division and separation of Ireland. There, the two tribes in Ulster and the South had built their own private armies, the Ulster Volunteers and the Irish Volunteers, both formed to defend their respective stance on Home Rule. Though they were equally anxious to be embodied in the British Army, the Secret Elite and, in this instance, Kitchener himself, favoured the Ulster battalions. He accepted the Ulstermen as a unit and rejected the Home Rulers, refusing to allow them to form a discrete division. If you consider the immensity of this decision and its political importance you will realise that Kitchener had to have been influenced by the Secret Elite. Desperate to impress the British establishment that Ireland would play her part loyally in defence of Belgium, and concerned that she would be dishonoured if the Nationalists did not support the war against Germany, John Redmond, the leader of the Home Rule Party went to meet Kitchener at the War Office on 6 August, 1914. His reception was cold and friendless. No-one took up Redmond’s generous offer that his Volunteers should defend the island’s coasts and the first of many opportunities to treat Ireland with a new found confidence and respect was rejected. Much more was to follow. The preferential treatment which the Ulstermen had always enjoyed from the British State continued to manifest itself. Prime Minister Asquith promised a new approach when he addressed a great rally in Dublin on 25 September. He declared: ‘We all want to see an Irish Brigade or better still an Irish Army Corps…’  Clearly he had not discussed this matter with Kitchener who would not countenance a distinctive Irish division with its own badge and colours, based on the Irish volunteers. An official request from Redmond that at least one of these battalions be trained in Ireland to encourage recruitment and pride, was summarily refused. Kitchener believed, as did the cabal which had pushed for his appointment,  that if the Volunteers were trained, armed and kept together in coherent units, there would be civil war once the crusade against Germany was over, with no advantage to Ulster. It was not the will of the prime minister which prevailed. These same arguments were not applied to Carson’s Ulster Volunteers. They were treated with distinct preference and in consequence the Ulster Volunteers metamorphosed into the 36th (Ulster) Division with their own distinctive uniform and badges. Not since Cromwell’s ironsides had a military force been united by such political unity and religious fervour. It was a decision which rebounded on the British state in the years following 1916. Kitchener treated his military allies in France with much more balanced consideration than he ever demonstrated in Cabinet. When the leading British ministers met with their French counterparts at the first inter-allied conference in Calais in 1915, Kitchener alone was fluent in French. He dominated proceedings. 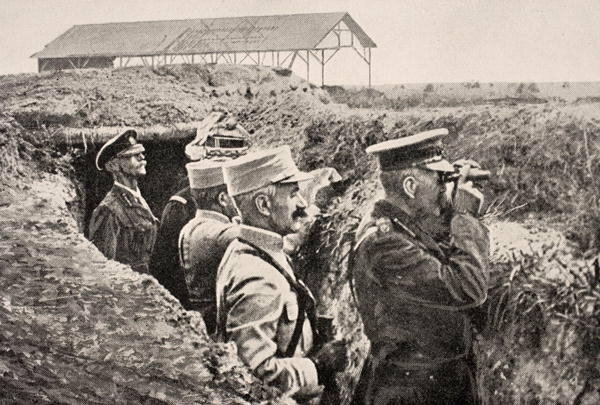 The British Cabinet had previously decided that there would be no fresh initiatives on the Western Front until 1916 and, anticipating objections, were surprised that the French agreed. What they did not know was that Kitchener had fixed a private arrangement behind their backs with Joffre, based on French support for the attack on Gallipoli, so when the autumn offensive was approved in military circles, the cabinet was not informed. Lloyd George became increasingly frustrated by the conduct of the War Office and its manipulation of fact and figures. Even Kitchener’s reports to the Cabinet about the progress of the war did not present a clear picture about what was happening. Kitchener’s distrust of politicians was such that, as Lloyd George put it, ‘his main idea … was to tell the politicians as little possible of what was going on and get back top his desk at the War Office as quickly as he could decently escape.’  And this was essentially Herbert Kitchener’s drawback. Despite his immense value in promoting recruitment, he would not be controlled. He frequently knew more than his field commanders and had a better grasp of strategy. His natural prejudices against Irish Home Rule was in accord with Secret Elite thinking but he would not brook overt political interference with the War Office. That was to be a problem. Sir George Arthur, Kitchener, Vol III, p. 7. A.J.P. Taylor, English History, 1914-1945, p. 47, footnote 3. The Times, 11 August 1914, p. 2. Army Order 324, dated 21 August 1914, then specified that six new Divisions would be created from units formed of these volunteers, collectively called Kitchener’s Army or K1. Subsequent increases were labelled K2/K3 and so forth. Trevor Royle, The Kitchener Enigma, p. 264. The Times, 19 August, 1914, p. 6. Royle, The Kitchener Enigma, p. 217. Max Arthur, Forgotten Voices of the Great War, p. 142. Arthur, Kitchener, Vol III, p. 13. Edward Davis, Inside Asquith’s Cabinet, pp. 188-9. A.J.P. Taylor, English History, 1914-1945, p. 48. Royle, The Kitchener Enigma, p. 264. The Times, 7 Jan, 1915, p. 9. Royle, The Kitchener Enigma, pp. 168-9. Taylor, English History, 1914-1945, p. 49. Peter Simkins, Kitchener’s Army: The Raising of the New Armies, 1914-1916, pp. 113-4. Royle, The Kitchener Enigma, p. 272. Freeman’s Journal, 2 September 1914. The Times, p.10, 26 September 1914. Hansard House of Commons Debate, 18 October 1916, vol. 86 cc581-696. A.M. Gollin, Proconsul in Politics, p. 240. Howard Green, Kitchener’s Army, Army Quarterly, April 1966, vol LXXXXII, no.1, p. 93. David Lloyd George, War Memoirs, p. 51.